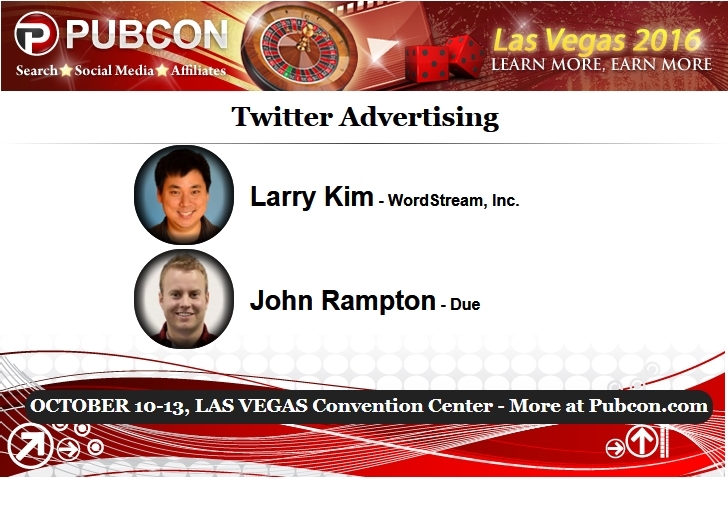 John Rampton partnered with Larry Kim, Founder and CTO of Wordstream, Inc., at Pubcon Las Vegas on October 12th to lead a discussion on Twitter advertising. The hour-long talk included many tricks and tips related to getting the most ROI from Twitter advertising based on their own experience and research they’ve conducted. Use Twitter Cards for your site because it is easy to do and improves how your tweets are received. It goes well beyond just a simple tweet that has a link with it because a Twitter Card can include author details, media, pictures and more. Various cards an be creates for different needs like website clicks or lead generation. Create specific hashtags that make you stand out rather than always going with the generic ones everyone in your industry seems to be using. Try out different budgets based on what the Twitter advertising portal recommends to see what works in different countries or demographics for your campaigns. Provide multiple tweets for each campaign to see which ones Twitter will promote. Each one should contain different content and pictures to assess reactions. Give the audience something in your advertising like a promotion or a download that can entice them even more and help you get more ROI for that Twitter advertising money you are spending. Know that there will be people out there ready to post something negative on your Twitter advertising so be ready with a response and deal with these people before they take over and ruin your campaign. Ensure that you are making all of your Twitter ads compatible with mobile advertising as this is where most of your audience will be seeing your Twitter ads. Take the time to understand how Twitter advertising really works, including what the reports mean in relation to how well your campaign did or what you will need to improve. Having this knowledge will help you improve your Twitter advertising ROI. Both Larry and John illustrated that Twitter advertising is a viable strategy to add to your overall marketing budget in terms of providing another viable platform to attract potential customers and make the most of what Twitter can do to build your brand and get you in front of the best audience for your industry and business offering.